Yesterday I saw a new blog post by Adam (9a4qv) in LNA4ALL. 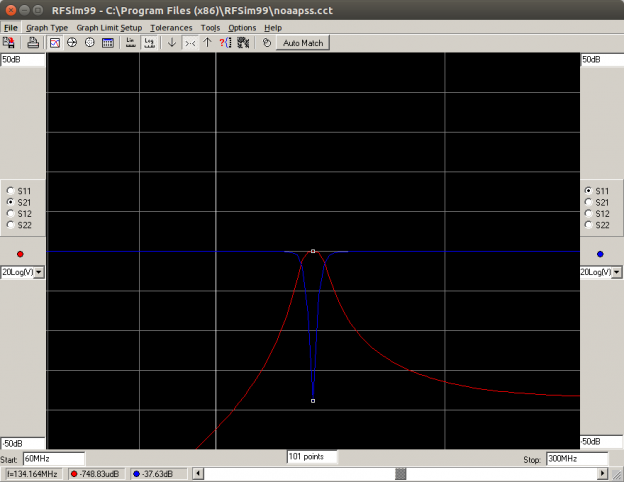 The post (here) talks about a band pass filter he did for Weather Satellites and I decided to try as well. Unfortunately I don’t have a exact match for that components at home, so I tried to do something with the components I have. So the lower value I had for capacitors was 10pF, and the needed values for Adam’s Filter is 1pF, 4.7pF and 15pF. I decided then to use 10 in series to do the 1pF, 2 in series for the 4.7pF (that will be 5pF) and then one in parallel with two in series to give me the 15pF. Its a very close match, and I’m unsure about the effects of serialization of capacitores in the filter (increase inductance maybe?). So here is the results. This entry was posted in English, Satellite, SDR and tagged 9A4QV, Adam, AGC, Antenna, APT, English, Filter, GQRX, HackRF, Linux, LNA4ALL, QFH, qspectrumanalyzer, RFSim99, RTL SDR, RTLSDR, Satellite, Satellites, SDR, Software Defined Radio, Ubuntu, Weather Satellites, WXSat on 13 de November de 2016 by racerxdl. GOES 16 in the house! Want to buy me a IceTea? Want to buy me an Ice Tea? Or maybe help me in the next project? You can donate via BitCoin, Ethereum, Paypal or Pagseguro. Receiving GOES 16 Weather Satellite Images with the Open Satellite Project - rtl-sdr.com on GOES 16 in the house!